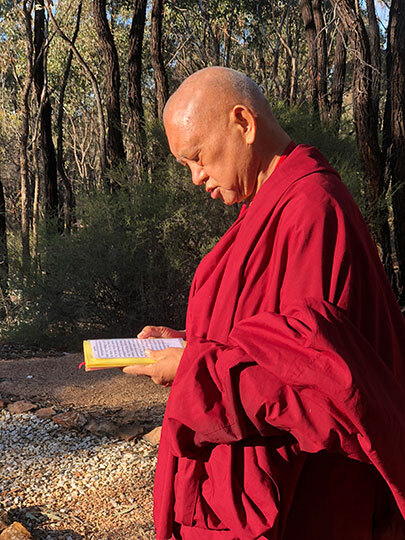 Lama Zopa Rinpoche offering to pretas and doing Dzambhala practice at the lake near Thubten Shedrup Ling Monastery, Bendigo, Australia, April 2018. Photo by Ven. Roger Kunsang. 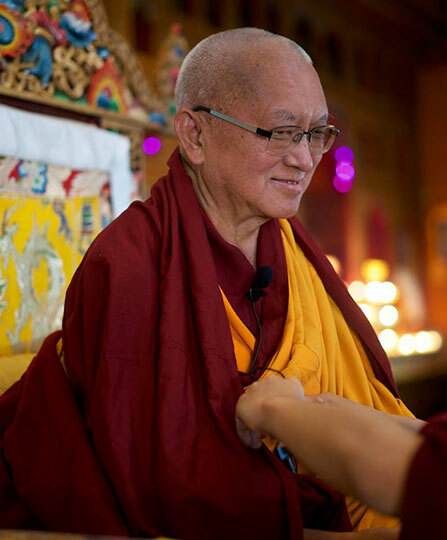 Read about and listen to the recordings of the teachings given by Rinpoche during the retreat. 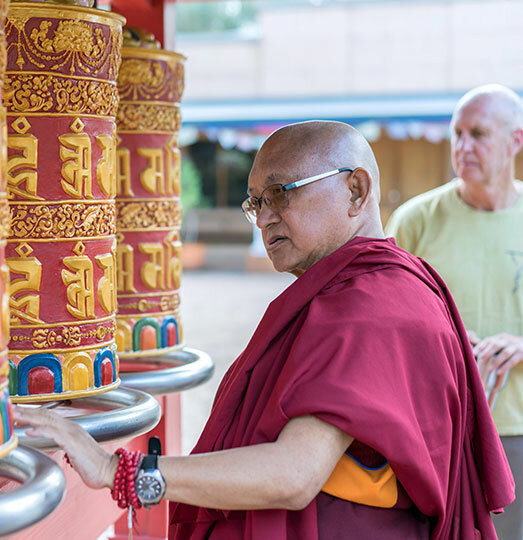 Lama Zopa Rinpoche’s schedule – find newly added teachings in Spain. 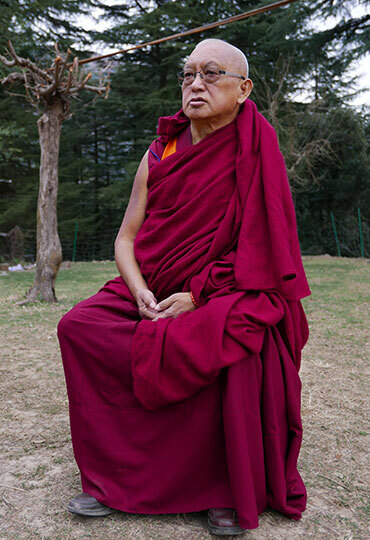 Lama Zopa Rinpoche, Dharamsala, India, February 2017. Photo by Ven. Roger Kunsang. Lama Zopa Rinpoche, Bendigo, Australia, April 2018. Photo by Ven. Lobsang Sherab. 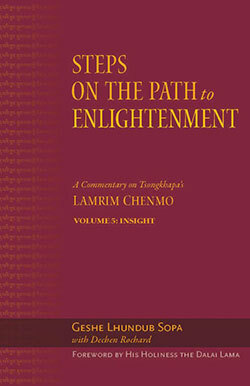 For over 20 years, Wisdom Publications, an FPMT publishing service, has been working on publishing a series of commentaries by Geshe Lhundub Sopa on Lama Tsongkhapa’s Lamrim Chenmo titled Steps on the Path to Enlightenment. Volumes 1 (The Foundational Practices), 2 (Karma), 3 (The Way of the Bodhisattva), 4 (Śamatha), and the final in the series, 5 (Insight), are now available through Wisdom’s website or via the FPMT Foundation Store. A US$500,000 grant for this series was made possible by a kind benefactor and offered through the FPMT Education and Preservation Fund to Wisdom Publications as the project progressed, resulting in the longest and most detailed lamrim commentary available in English. Learn more about this decades-long project, which began in 1976, when Geshe Sopa first offered these lamrim teachings. As Saka Dawa approaches, consider joining our annual Work a Day for Rinpoche campaign and help spread the Dharma. How can you help? Participate by making a financial offering of a day’s wages in support of the efforts of Lama Zopa Rinpoche’s International Office or offer your voice by reciting the Sutra of Golden Light for peace and happiness … or do both! All offerings will be dedicated on Saka Dawa, May 29, a merit multiplying day. Learn more! The Method to Transform a Suffering Life into Happiness (Including Enlightenment) with Additional Practices, now available in print. Students will also benefit from Lama Zopa Rinpoche’s commentary on the practice, available in ebook format. A Daily Meditation on Shakyamuni Buddha, now available in print format, was specifically compiled by Lama Zopa Rinpoche for beginner Buddhist practitioners to use as the basis of a formal meditation practice. Refuge in the Three Jewels, now available in ebook format, includes the practice of taking refuge, the commitments of taking refuge, the vows themselves, and explanations of how to receive a downfall as well as the benefits of protecting these precious vows. Prayer to the Six-Syllable Great Compassionate One, now available in ebook format, includes eloquent praises and mantra recitation to Chenrezig, the Buddha of Compassion, to help develop the mind of compassion, with teachings on the benefit of such practice by Lama Zopa Rinpoche. The Preliminary Practice of Tsa-Tsas, now available in ebook format, contains all the instructions needed for creating tsa-tsas, including the actual practice and practical advice. Medicine Buddha Sadhana, now available in ebook format, was translated by Lama Zopa Rinpoche for the benefit of all wishing to be healed of their mental and physical ills. Lama Zopa Rinpoche, Kopan Monastery, Nepal, December 2017. Photo by Bill Kane. 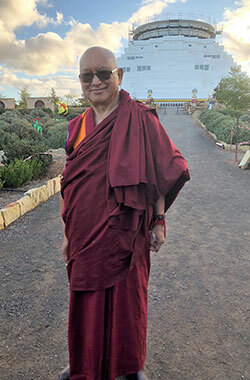 You can find Rinpoche’s quotation “Live with Compassion” beautifully formatted for printing in the FPMT Display Pack, which is in the ”For Display in Centers, Projects, Services and Study Groups” section of the Affiliates Area. Lama Zopa Rinpoche and IMI Sangha, Great Stupa of Universal Compassion, Australia, May 2017. Photo by Ven. Lobsang Sherab. We welcome Palden Chodarg Study Group (probationary center), in Lisbon, Portugal. 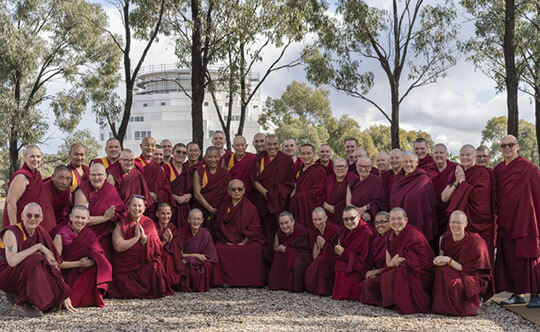 This means that there are now 165 FPMT centers, projects, services, and study groups (which are probationary centers, projects and services) in 40 countries! It is now July 19-23, 2018, at Milarepa Center, Vermont, USA. Newly added: Atisha Center, Australia, urgently needs a café/kitchen manager.